Secure – 2 Part IV cannula dressing is a new worldwide patented design of cannula dressing that comes in 2 parts. This provides more stability by reducing movement in all directions with venous complications avoided and the possibility of infections. Currently 80% of patients admitted to hospital have a cannula inserted and in some cases this often involves two vascular devices per patient. 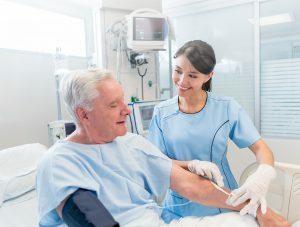 Repeated cannulation is also another consideration as this can often be required especially with extended courses of treatment such as chemotherapy. Therefore it is important that a stable and secure cannula dressing surrounds the entire insertion site providing a sterile barrier to external viruses and bacteria while giving peace of mind and comfort. After approval of the proposal by Clinical Governance Committee of The Spencer Private Hospital, East Kent Medical Services the dressing was used on patients by the Consultant Anaesthetists. In the study the responses were recorded rating various aspects of the use of access, user friendliness and quality of the product. Each consultant used the new Secure 2 PART IV cannula on their patents with the overall impression that this dressing secured the cannula well and did not allow any /dislodgement and therefore did not result in any restarts, infiltration or other problems. The majority of Consultant Anaesthetists 92% held a positive view in overall performance using the new Secure 2 PART IV cannula dressing with their patients. The ward nurses too thought it provided better securement of the cannula resulting in reduction in the problems they usually face with IV lines. The practitioners found it easy to follow in 94.67% of uses.